The past season is over; Patrollers eagerly prepare for the next - coming soon, as in days away. Snow? Not as much as we'd like but there were a few good days - just a few, and Mt. Pinos showed her true colors coming alive under a blanket of white. Though our new season is now upon us, we take time to reflect on the great things our Patrol did last year. October 2014 started with a fresh coat of paint to the interior of Nordic Base. Built by volunteers and USFS personnel in the 90s, the base serves as our home and the place where we are able to assist our guests in need. Walls stripped cleaned; holes patched; paint applied and our home given a good scrub. Paint and all the supplies were donated by various Patrollers and guests who donated money throughout the season. Our Patrol survives on donations. Generosity, both financially and in our volunteers time and support, is what makes us great. As a Patroller, you understand training is a normal part of life - something that is done constantly. 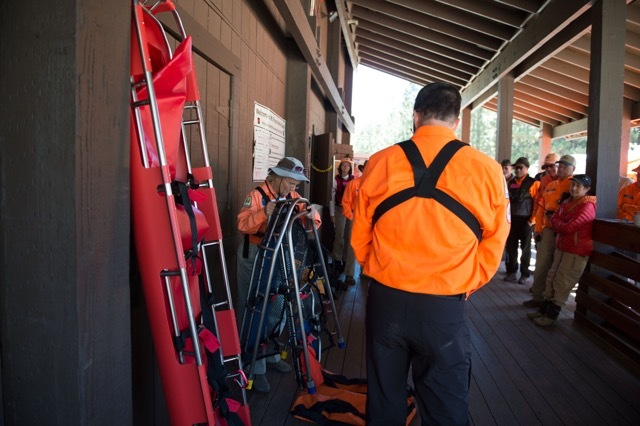 Though most patrollers train throughout the year, the Patrol still holds an annual "On the Hill Refresher" to ensure members are up to speed with the requirements needed to provide Mt. 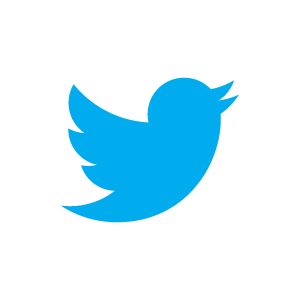 Pinos guests with the highest level of service. Proven equipment is an important factor in our success and the Patrol, thanks to the superb generosity of CMC Rescue and an anonymous donor, was gifted with both a new titanium litter and stretcher. This state-of-the-art equipment was a welcomed addition to the Patrol, and our members were extremely excited to train, and eventually utilize, this gear in the coming months. True, the snow wasn't spectacular but when it did come, members were on the mountain doing what we love. Some of the best snow arrived in December, and patrons from all over SoCal came to the mountain to enjoy a variety of winter activities. We find it odd that so many people don't realize Mt. Pinos is here. 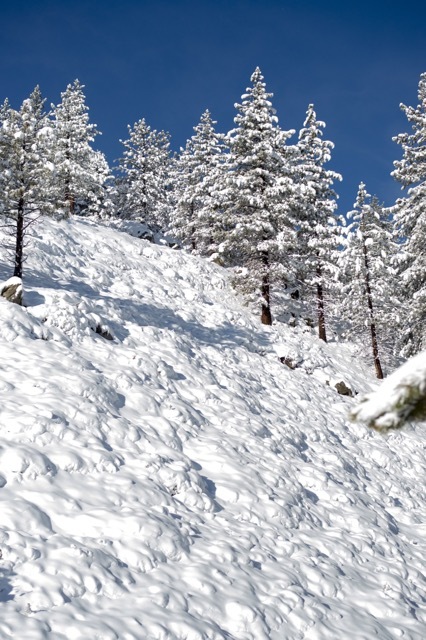 We're only 90 minutes from Los Angeles and our elevation, above 8,300', is ideal. Yes, it might look like Colorado but no, this is definitely California. 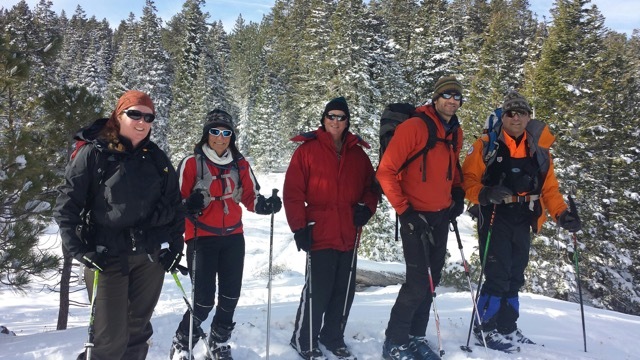 Although we didn't have the snow we wanted, SCNSP had a strong group of candidates with two achieving Nordic Patroller status in 2015. Throughout the year, candidates trained with other Patrollers ensuring a complete mastery of the skills required for the position. Training sessions, though long and detailed, were always fun and filled with excellent camaraderie. 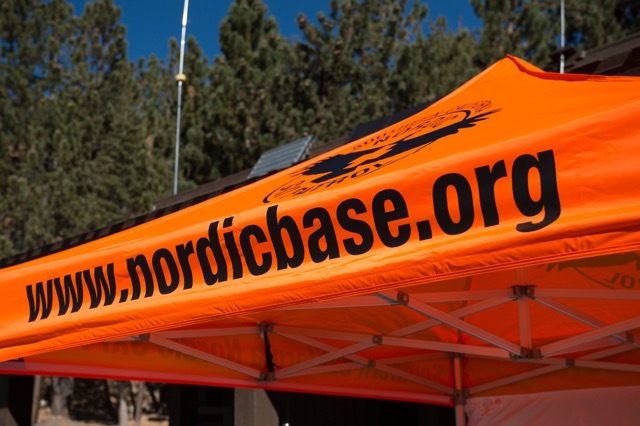 If interested in becoming a Nordic (Backcountry) Patroller, please send an email to info@nordicbase.org. Our volunteers make us great and we are always looking for new candidates to join the team. Training continued throughout the spring, summer and into the fall, as Patrollers met monthly to hike the trails around Mt. Pinos. We used these hikes to enhance our knowledge of the area, while doing our best to help keep the trails in good shape. Patrollers moved down trees, cleaned up trash and further refined known trail coordinates in an effort to update our maps. Will it be a monster El Nino? We can only hope. Though none of us can forecast the future, the Patrol is kicking off our 2015-16 season as if every weekend was measured in feet and not inches. True, it's hard to think about snow when the temperatures in Los Angeles are soaring to the high 90s, but we know that the safety of our guests demands us all to be as well prepared as possible. If the snows come, we'll be here... We invite the public to join us at SoCal's best kept winter secret - Mt. Pinos.